First, Happy Tibetan New Year! The New Moon is passed and we are into a new month and also a new year, Tibetan-style. I thought it might be helpful to say something about the very popular short mantra "Om Mani Padme Hum." The most common mantra in the world is the six-syllable "Oṃ Maṇi Padme Hūṃ," which is generally pronounced and written "Om Mani Padme Hum." The Tibetans tend to pronounce it "Om Mani Pay-Me Hung," and it exists in many other pronunciations in languages like Mongolian, Chinese, Korean, Japanese, Thai, Vietanamese, and so on. The first and last syllables, "Om" and "Hum" are interjections with no special meaning in themselves, other than that "Om" is a syllable of affirmation and typically begins many mantras and "Hum" often closes or ends mantras. "Hum" or "Hung" (as the Tibetans pronounce it) is semi-wrathful or at least emphatic, and is often used to destroy negativity or to protect. That leaves the four other syllables that make up the two words "Mani" and "Padme." "Mani" simply means jewel and "Padme" means lotus, and refers to the Padma Family, that of the Buddha Amitabha, the direction West, and the setting sun, often associated also with death and dying. The Buddha Amitabha is often shown with his two bodhisattvas, of which the one shown here, Chenresik in Tibetan (Avalokiteshvara in Sanskrit) represents loving kindness and compassion. The other bodhisattva (not shown here) is Vajrapani, often depicted as a fierce protector of the secrets of the dharma, but with Amitabha, he usually is shown standing in a peaceful pose. As to what this mantra means, putting aside the interjections "Om" and "Hum," it is usually said that it means the jewel in the lotus. 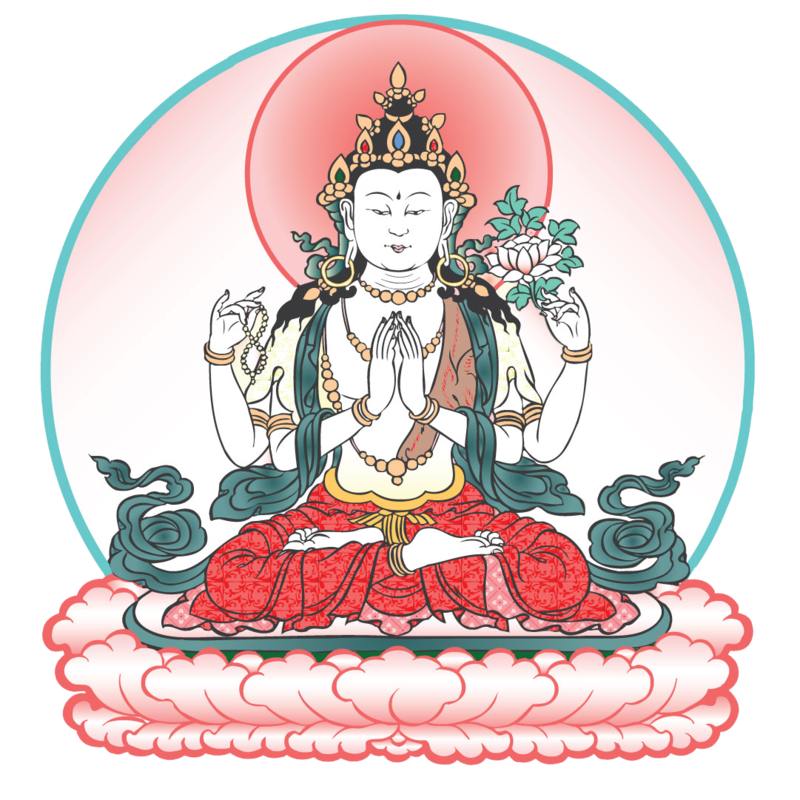 However, the great rinpoches that I have heard teach says that it means "the one with the jewel and the lotus," referring to the image of Chenresik in which he holds a lotus in his left hand and a jewel between his two hands that are cupped in the prayer mudra. They say these words simply remind us of whom we are speaking of, you know, the one holding the jewel and the lotus. Of course, there are whole books written about the meaning of this mantra, often associating each of the six syllables with one of the six realms of existence (god realm, jealous-god realm, human realm, animal realm, hungry-ghost realm, and hell realm), but I am not going into all of that here. Mantras serve many purposes, one of which is to utter a prayer or acknowledgement of a given quality or deity (and deities represent qualities), in this case the deity is Chenresik and the qualities are, as mentioned, compassion and loving kindness, something I know I could use more of. This Mani Mantra, as it is called, is probably the most common of all mantras, used by millions of people all over the globe. This is the mantra that represents His Holiness the 14th Dalai Lama and also His Holiness the 17th Gyalwa Karmapa (Orgyen Trinley Dorje), who each are said to be a living representative of the bodhisattva of compassion Avalokiteshvara in Sanskrit, Chenresik in Tibetan, and Quan-Yin in Chinese. Aside from invoking loving kindness and compassion, the Mani Mantra (like many mantras) is also used as a focus for Tranquility meditation (Shamata), as well as a touchstone for Insight and Mahamudra meditation, helping to maintain clarity and insight through mindful repetition. This is how I often use it. Great lamas recite this mantra whenever they encounter a living being. I can tell a quick story here. Many years ago Margaret and I put on a series of what we called Dharma Family Weekends out at some lake cottages near where we live. The idea was to bring the whole family together, kids and all, in various dharma activities. It was a lot of fun. We would often bring very high Rinpoches out to see the cottages. Well, one time we brought one of the Four Regents of the Kagyu Lineage, the so-called Heart Sons to see the cottages. However, that particular year the gypsy moths were devastating the trees on the property. Every tree and bush it seemed was covered with these webs from which were hanging countless caterpillars in the midst of destroying the vegetation. Anyway, this particular Rinpoche on seeing the devastation immediately went up close to a large bush and began blowing gently on the worms and blessing them. Here we were cringing from the massive destruction, while Rinpoche was blessing as many as he could, one by one. While I am at it, I might as well tell one more story of this same Rinpoche. I am not going to mention his name, in case this story is inappropriate, but here goes. We were sitting with His Eminence in our living room, having just finished a TV interview or something with the press. There we were sitting in a circle, perhaps having tea or something. Suddenly one of my kids, a daughter, comes running in crying loudly, and yelling "The neighbor's cat is going to eat the baby birds." We know cats and their habits. Of course the cat would eat the baby birds that were nesting in the tree on our property, just outside the door. All I could think of is that I should stop the cat somehow. I had a very low-power BB gun in the house, so I jumped up, grabbed the gun, and ran outside. I forgot for the moment our special guest. Anyway, sure enough, up in the main crotch of the tree, where the branches divided, about ten feet above us, was a nest of robins, with a whole bunch of little bald-headed babies. And sitting right in front of the nest, with his paws folded underneath him was a big fat cat with his nose only inches away from the baby birds. And the cat was contemplating breakfast or whatever. Without thinking I pumped off a few rounds of BBs, but as mentioned, the gun was so weak that the BBs just bounced off the cat. Yes, the cat twitched, but there was no way it was about to leave. Meanwhile, all the kids were yelling and I shot off a couple more rounds, again to no effect. Then I felt a hand on my shoulder. It was the Rinpoche. Oh my god I thought, I forgot about the rinpoche and here I was shooting at a sentient being, in this case, the cat. Rinpoche said, "Give me the gun!," I hung my head and handed over the gun. He then said "Where is the cat?" I pointed up the tree to where the cat was sitting as happy as ever in front of those tiny birds.